Jeremy Garnet is a budding novelist living his modest, literary life in the city. His rambunctious friend Ukridge pays him an unexpected visit with his newly married wife and announces his intention to start a chicken-farm in the country to make a living. Does he know the first thing about chickens? Not much, but Ukridge believes in his hypothesis that eggs are fundamental to every-one's existence, and that if the chickens were given the space to run around and roost and peck a few grains, they would diligently lay him plenty of eggs to be sold and bring him a phenomenal profit. Ukridge drags Jeremy with him to the country to help him with his farm. What ensues is a hilarious fumble with the obstinate chickens, and a little romance spicing up Jeremy’s life, although the love of his life has an irritable father whom he needs to temper. 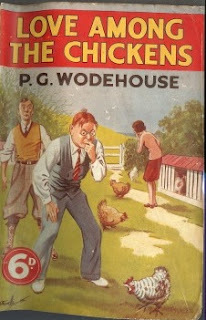 Now be forewarned that Wodehouse’s early books are just a shadow, a mere hint of his later books. This was the time he was honing his skills and nuances. A time before his imagination stumbled on Jeeves, Bertie, Gussie Finknottle, the Glossops, Lord Emsworth and Psmith... and many many more wonderful characters. This book is more of a lighter version of Wodehouse, both in terms of the language and the humor. However the humor picks up and the climax is delivered in his quintessential hilarious, chaotic manner :). Reading this book after so many years reminded me of the simple age when I used to naively and passionately spend several hours with a dear friend of mine, discussing, dissecting and applauding every brilliant sentence, structure and character of Wodehouse. Anyway, plenty of nostalgia and all that makes this book even better than it actually is. Digested thoughts: I would recommend this book if you are a Wodehouse fan, or if you want a taste of his style by reading a lighter version. The language is as impeccable as ever, but not as masterful as his later works. Same goes for humor. It is definitely a book to lift your spirits and enter a lighter mood. I love wodehouse too! And luckily, there are several of his books I am yet to read including this one! Actually the first one of his that I read was one of his early books called white feather, and I too felt he was just honing his skills then.